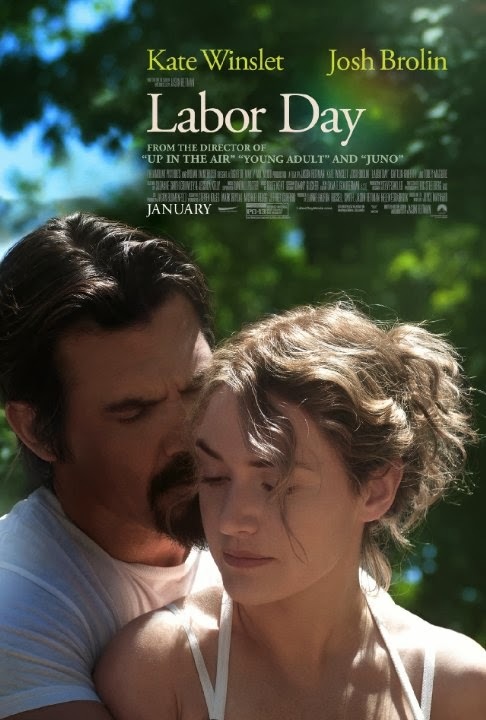 Another book-turned-movie has hit theaters, and it's definitely worth checking out - Labor Day, by Joyce Maynard. Kate Winslet quietly picked up a Golden Globe nomination for her role in the movie, and although she didn't win (Cate Blanchett has been sweeping the 2014 awards), she and also Josh Brolin were very good in this film. Adele (Winslet) rarely ventures out of the house these days; when she does, it's with her son, Henry (Gattlin Griffith), and they go grocery shopping. On this such occasion, Frank (Brolin), an escaped convict, starts talking to Henry and makes him take him over to his mother, where it's implied that harm will come to them if they don't give him a ride. They all go back to their house and Adele treats his wounds; he escaped from a hospital by jumping out a second-floor window. The news is soon awash with news of Frank's escape, as he was serving an 18-year sentence for murder, and Adele and Henry must decide if they can trust him, while at the same time learning that he's not exactly whom the media portrays him to be. This movie took place in 1987, and it was rather refreshing; Adele and Henry's house is a sea of beigeness, and feels lived-in and homey. Adele and her ex, Henry's father (Clark Gregg), have been divorced for a while, and Henry has a stepbrother and a half-sister whom he often visits - Adele never talks about it, but she hasn't had a man around the house in years. Brolin's character teaches them how to make a peach pie; he fixes the car and tends to the house; he teaches Henry how to play baseball well, a skill he uses later in life. Young Frank's life, pre-prison, is told slowly, in flashbacks, showing more than telling, and we learn why he says to Adele something like he's never hurt a person on purpose. Yes, definitely see this movie, as it's the best one I've seen in a while. Brolin and Winslet were great in their roles, and so was Gattlin Griffith, who plays young Henry. Tobey Maguire narrates the film as an older version of Henry, and we finally see him at the end, once his character has grown up. Clark Gregg and James Van Der Beek also have small roles in the film. I'm surprised the movie didn't get more awards recognition, save for Winslet's nomination, but it's possible that there were too many good films to choose from in 2013; the Academy's list for Best Motion Picture proves this. I would recommend Labor Day for anyone that enjoys a good family drama, if that makes sense, or really for anyone who enjoys movies in general. Labor Day is in theaters today, January 31st, and is rated PG-13 with a runtime of 111 minutes. 4.5 stars out of 5. I love Kate Winslet! I hadn't heard of this movie yet, but will definitely have to watch it! Yes, I'd like to check out the book at some point too! How have I not heard of this one! I have to see it! It looks amazing. And I love Josh Broulin! I've been on the fence about this one, it's been kind of a sleeper. I know I wan to rent/stream it for sure! I've read a lot about the pie scenes. I've heard good and bad. I don't live anywhere near a theatre so I'll wait for download but it's the kind of movie I like so I'll probably download it when it's available. The peach pie they make in the movie looked delicious. I saw it was the author's personal recipe that is now on Facebook, too. Surprisingly, I haven't heard much about this film, might be a nice one to catch! I really want to see this one. Thanks for the great review.